Calli Be Good by Michele Weber Hurwitz. 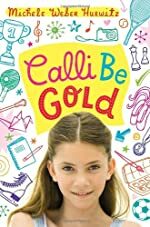 Review: I struck gold when I read Calli Be Gold, written by Michele Weber Hurwitz. The main characters are Calli, her sister, brother, mom, dad, and Noah. Calli, an 11-year-old girl, isn't very busy in her life, but everyone else seems to be. Noah is a strange, young child Calli meets when she is at the skating rink waiting for her sister. This unusual friendship sparks and changes Calli's life forever. In Calli Be Gold, Calli watches as her family bustles around everyday. Her sister and her brother are both in sports. Her sister, Becca is on the ice-skating team; her mom helps design costumes for the ice-skating team, and her brother, Alex is on the basketball team. Their new lives are so hectic; her mom color-coded sticky notes to keep track of everyone's busy schedule. In the story, Calli "meets" a boy under the hockey-foosball table while Becca is skating. Together Calli and Noah join a program called the Peers Helpers Program (PHP). Calli and Noah are paired with each other for PHP because Calli "knows" Noah. Although Noah is very quiet and likes to hide under his desk, after he gets to know Calli more Noah starts to talk to more often. Through the experience Calli learns a lot about herself and her friends. Calli Be Gold is a truly excellent book, although there is a bit of a slow start. But it's worth hanging onto because towards the middle it becomes really interesting and I found myself not wanting to stop reading it. There are great details that help the reader create visual images while reading, and it also teaches a spectacular meaning of friendship. Michele Hurwitz is an amazing writer. I rate this book 4 out of 5 stars, because it is a great book but it did have a little bit of a slow start. I hope that Michele Hurwitz will write many more novels, and if she does, I will be sure to read them all, because she is such a talented writer! We would like to thank Random House for providing a copy of Calli Be Good for this review. Have you read Calli Be Good? How would you rate it? This sounds like a great book! I love your review and (even though I don't really like books with slow beginings) I'm willing to try this one. Great review Hannah!